Did you know that not all garnets are red? They also come in shades of violet, yellow, orange, green and blue. There's even a variety that appears blue/green in daylight and reddish- or pinkish-purple under incandescent light. The color of a garnet is determined by its mineral composition. Garnet comes from the Latin for Pomegranate "granatum" as small garnets do indeed look like the bright red seeds you find in a pomegranate. Garnets have been encountered in civilizations dating back to 3000 B.C. It's even reported that Noah used a lantern made from garnet to guide the ark at night. The nineteenth and twentieth centuries marked the discovery of colors other than red. ​Garnet is the gemstone for January and for the Zodiac sign Aquarius. It is the traditional gift for second and sixth anniversaries. In earlier times garnets were exchanged as gifts between friends to demonstrate their affection for each other and to insure they meet again. Garnet jewelry was immensely popular during Victorian times. Bohemia, now a part of the Czech Republic, was once a major garnet mining, cutting, polishing and setting center. Bohemian garnet jewelry is often recognized by the way the garnets are set closely together resembling a pomegranate. 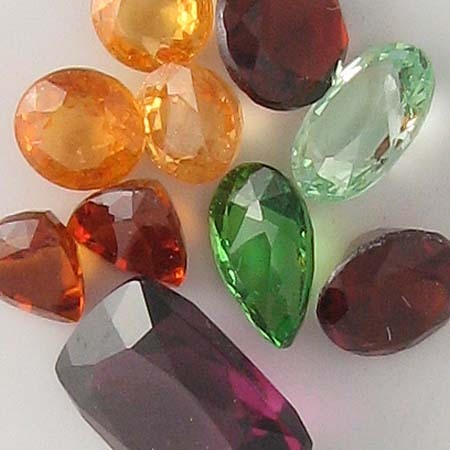 The various colors of garnets are described separately below. Care: Clean with mild dish soap: use a toothbrush to scrub behind the stone where dust can collect. ​Almandine is a deep red transparent garnet often known as precious garnet and is one of the most common forms of garnet. Sometimes this type of garnet is known by the name carbuncle, particularly when it is cut as a cabochon - an unfaceted stone with a smooth domed top. It is believed that almandine garnet brings deep love. It is also thought to initiate charity and compassion. ​Demantoid - a spectacular green garnet - was found in the Ural Mountains of Russia in the 1850's and is sometimes called the emerald of the Urals. Its fire or sparkle is greater than that of a diamond. It is one of the rarest and thus most expensive of all garnets. Grossular garnets come in shades of green, yellow and brown. The name grossular comes from the botanical name for the gooseberry "grossularia" as the green garnets of this type resemble the green gooseberry. Hessonite and tsavorite garnets are varieties of grossular garnets. 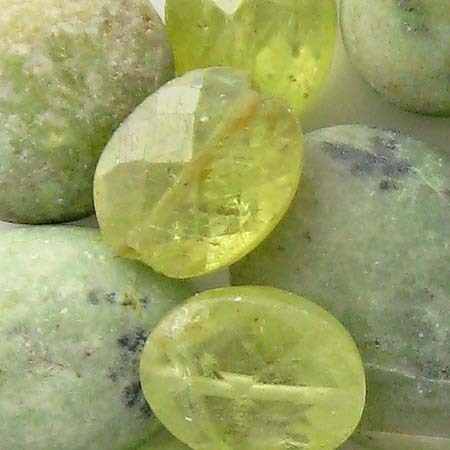 The light green gem and the green and yellow beads in the photos at left are all forms of grossular garnets. 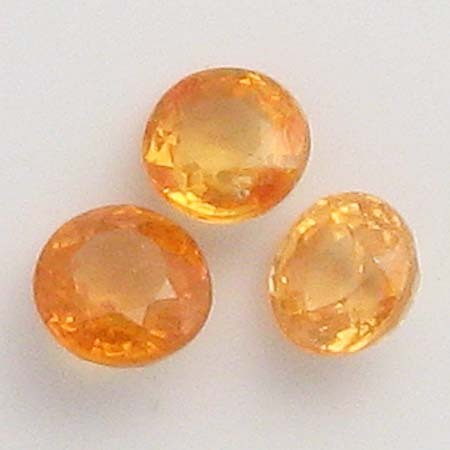 Grossular garnet is said to teach relaxation and inspire service and cooperation. ​Hessonite, also called cinnamon stone, is a beautiful cinnamon brown to orange garnet. Hessonite garnet is believed to impart self-respect. It is also said to open intuition and psychic abilities. 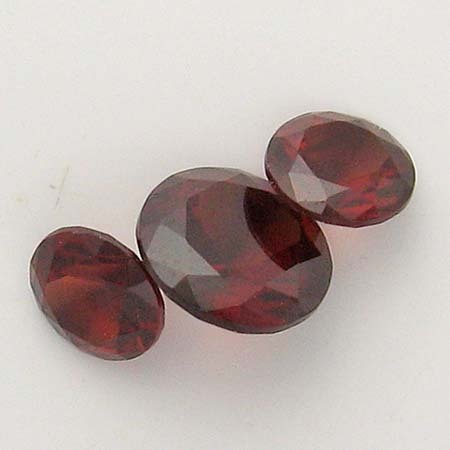 ​Pyrope garnet is another type of red garnet. 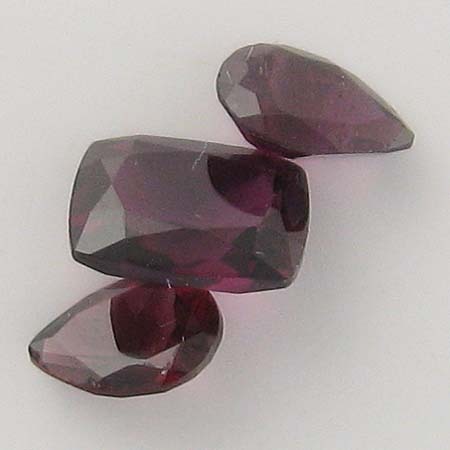 Varieties of pyrope garnet that have a violet undertone are known as Rhodolite garnets. The gems in the photo at left are probably pyrope garnets. Pyrope garnets are said to bestow vitality and promote an excellent quality of life. ​Rhodolite is an exquisite rose to pink garnet with undertones of violet. The name comes from the Greek "rhodon" for rose. Rhodolite garnets are believed to stimulation intuition and inspiration. Spessertite (also called Spessertine) is a glorious red/yellow to red/orange garnet. 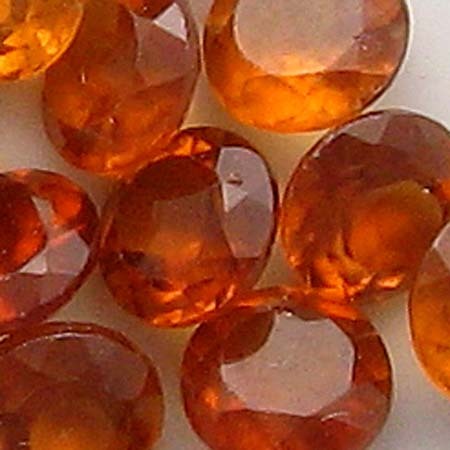 It is also know as Mandarin garnet since its color is exactly the color of oranges by the same name. 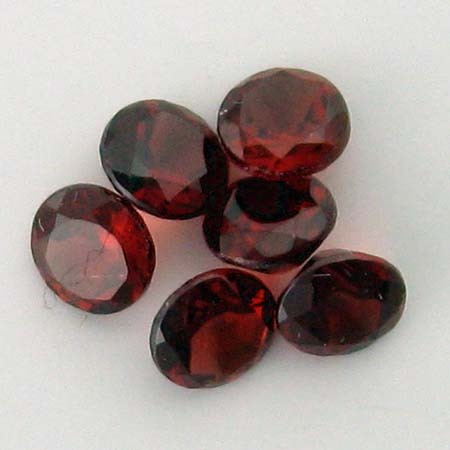 Spessertite garnets are thought to be an anti-depressant and to suppress nightmares. 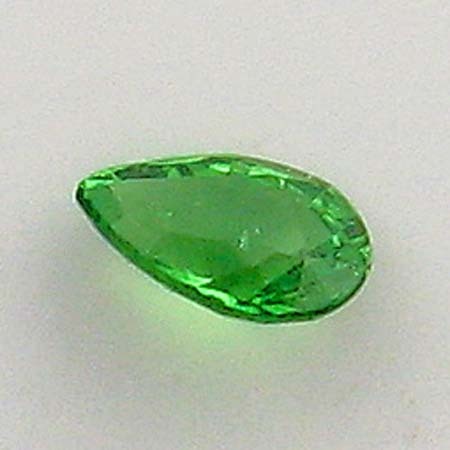 ​Tsavorite is another stunning green garnet. It was discovered in the 1960's in Tanzania and then in Kenya in the 1970's. Tiffany's brought it to the public's attention in 1974 and proposed the name in honor of the Tsavo National Park in Kenya where it is mined. Borosilicate glass, best known as Pyrex, is any silicate glass having at least 5% boric oxide. 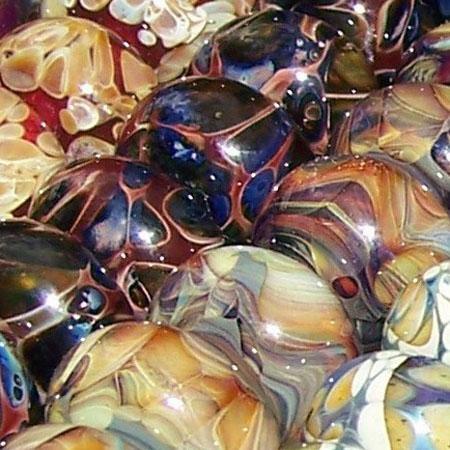 Developed originally for scientific and industrial uses, lampworking techniques led to artistic uses such as beads, pendants, marbles/paperweights, vessels and sculptures. The beads pictured were made by Brian Schmitt of Shack Man Glass Studio in Denver, Colorado. Made in Bohemia, now the Czech Republic, where glassmaking has been a tradition for over 2 centuries, Czech glass beads come in a wide variety of colors and shapes and are considered among the best available. Czech glass beads that are faceted and then fire-polished rival the sparkle of lead crystal. Soft glass is soda-lime glass and is most commonly known as Moretti glass after an early Italian manufacturer. Moretti is the most common glass used for lampworking. 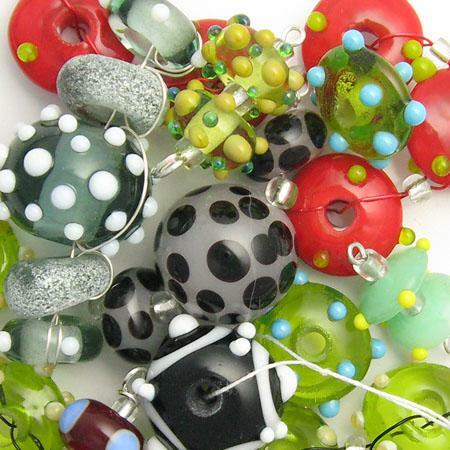 Glass artists form the glass into fancifully shaped beads in brilliant colors. The beads pictured were made by Jacques Henning of Neovetro in Denver, Colorado. Gold is one on the "precious metals". The others are Silver and Platinum. Throughout history gold has been used jewelry, coins and other arts. It is also used in industry, particularly for electrical connectors in all types of computerized products. Pure gold is 24 karat (abbreviated kt) - 24 parts gold and 0 parts other metal. Karat is a measure of the fineness of gold. Pure gold is too soft to be functional so gold is usually alloyed (combined) with other metals for durability, cost and color. Thus, 14kt gold is 14 parts of gold out of 24 with the remaining 10 parts another metal. The other metal may be copper, silver, zinc, nickel, tin, palladium and/or manganese. Gold comes in colors such as yellow, white, rose, or green. The type of metal alloyed with the gold determines the final color. The chart below shows the percentage of gold in the most common karat weights available in the US. Gold-filling is the process of bonding, usually by a combination of heat and pressure, karat gold to a base metal usually brass. By law, to be called gold-filled at least 20% of the metal by weight must be karat gold and the karat weight of the gold cannot be lower than 10kt. 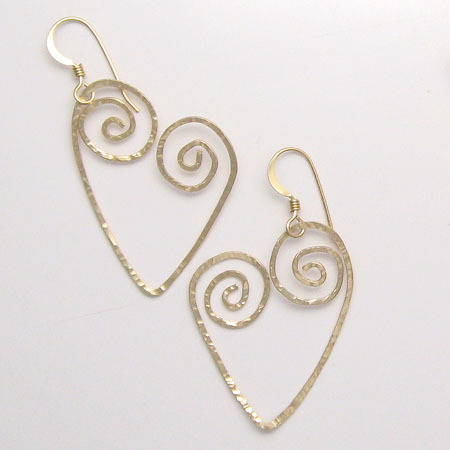 The gold-filled wire that I use is either 20% 12kt or 14kt gold bonded to red brass. The ear wires and clasps I use are usually 20% 14kt gold bonded to brass. In general, gold filling is anywhere from 50 to 100,000 times thicker than regular gold plating and 17 to 25,000 times thicker than heavy gold electroplating. Gold plating is more susceptible to wearing off and scratching than is gold filling. Gold-plated is real gold over base metal. A very thin deposit of gold is electroplated or electrochemically applied to the base metal. By law the gold coating must be of at least 10kt and a minimum of 1/2 micron (approximately 20 millionths of an inch) thick. Heavy gold electroplating is approximately twice as thick. Gold plated over sterling silver is called Vermeil. Gold plate is delicate. The finish will rub off with frequent wear. For this reason, I seldom use gold-plated components in my jewelry. ​Goldstone is a man-made gemstone. It is reddish-brown glass with tiny copper sparkles visible throughout. A special process is needed to create the stone's metallic gleam; copper salts are added to colored liquid glass. The mass of glass is held at a specific temperature for a length of time, and then allowed to cool. As the glass cools, the salts turn into copper crystals, creating that unique sparkle. Goldstone reportedly originated with Italian monks trying to make gold out of other materials (alchemy). Because of its origins in the monastery, goldstone is used frequently in religious jewelry. Goldstone is believed to store the energy of those who touch it. It is also believed to be a powerful energy generator and to deflect unwanted energies. It is claimed the copper in it helps to reduce inflammation and increase circulation. 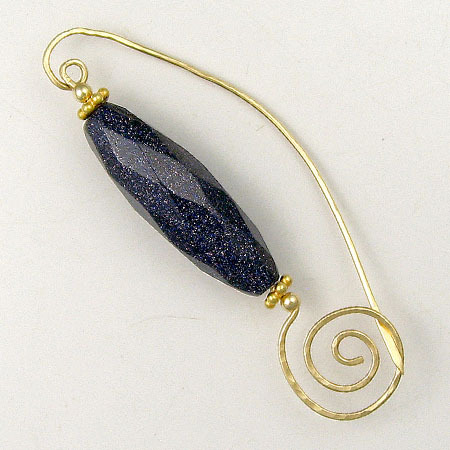 ​This variety of goldstone is made using blue glass instead of reddish brown. Its deep blue color looks like the midnight sky sprinkled with stars. 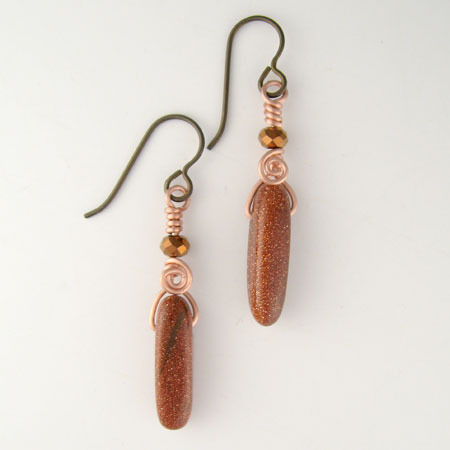 ​This variety of goldstone contains green flakes as well as the usual copper dots in the glass. It is much harder to make than the other varieties and thus is more rare.